This might be a tall order but February 14th dawned without a cloud in the sky, nor a hint of wind with the promise of seeing the sun. 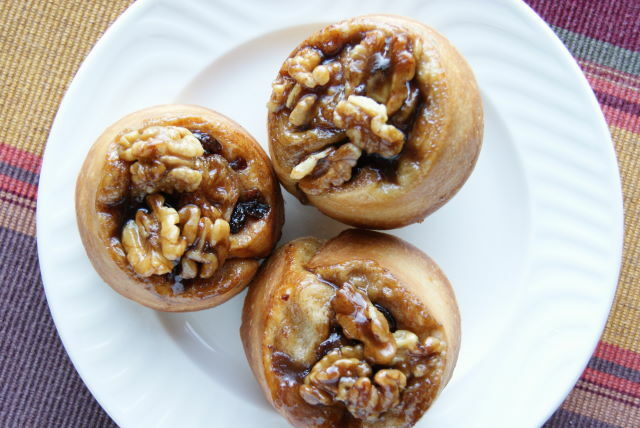 First things first….a breakfast of hot out of the oven walnut sticky buns was the request on this special day. I don’t have to head over to the end of the beach today to find the sun. I grab a chair, call the cat than head down to the heli pad. I still may have to wear an additional layer, now 4 in total to feel comfortable enough to sit out but ohhh that sun did feel nice. I was able to get a good half hour before a cold wind won out and I headed back inside. Sammy has become much bolder these day. 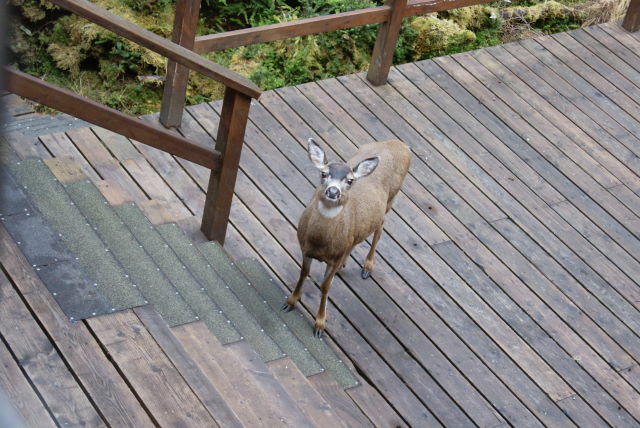 I don’t know what enticed him to start appearing on the back deck but it makes us laugh every time we see him. Maybe he was looking for a Valentine’s treat, which he got for looking so cute. Please Mikey, may I have some more? I couldn’t go out and buy chocolates for my sweetheart but I could make a favourite dinner and dessert. Spaghetti, french bread, a nice bottle of red wine, warm apple crisp with homemade vanilla ice cream…just in case you were wondering. A couple of sailing magazines bought on line and sent along with a special email made a good surprise. Being up here you have to think outside the box for gift giving. 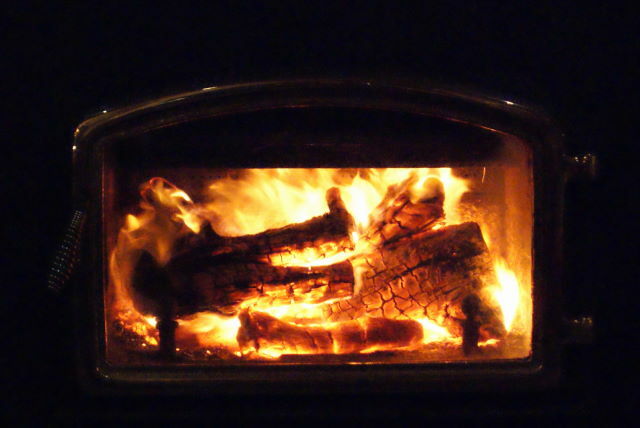 My request for a gift of heat came in the guise of a wonderful fire. Having to be very frugal with the fuel these days, the furnace/boiler has been turned off. Kind of ironic since we waited so long for the part to arrive to fix it and now we can’t afford to use it. A small stack of wood was all that was left from everything we cut earlier in the season and having sat inside all this time made for one rip roaring fire. In no time at all the temperature of the lodge went from a normal 60 degrees to 70. Absolute heaven! Why don’t we have a fire all the time? Everything that we felt comfortable ( referring to feeling of safety ) chopping down, we did. Any previously fallen tree that we could get to and use the chainsaw on have all been cleaned up. Mike recently did cut down several smaller trees but the wood is so green that it smolders more than it burns. So for now we’ll continue just with our heaters and each day is a day closer to spring and warmer weather. 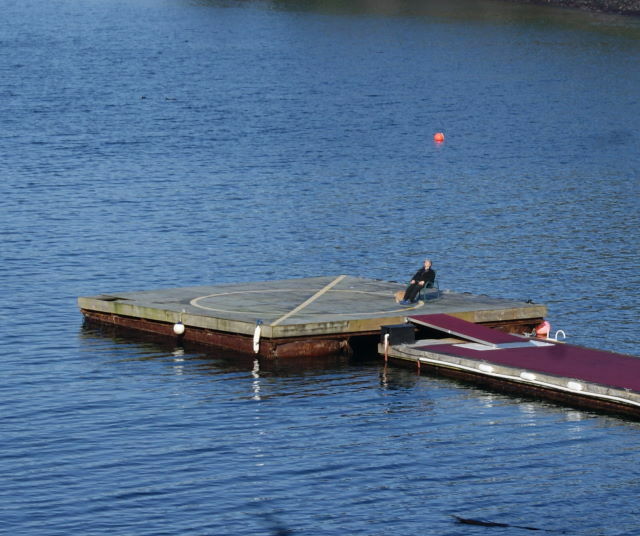 Oh……can’t forget about the barge, maybe their 4th attempt will be the charm. While watching our nightly movie, tonight it was “Valentine’s Day” ( a movie I had downloaded this past summer just for tonight) a slight movement at the window caught my attention. It was just in the lower corner and I really couldn’t see what it was until he moved his head and 2 little beady eyes were staring in at us. 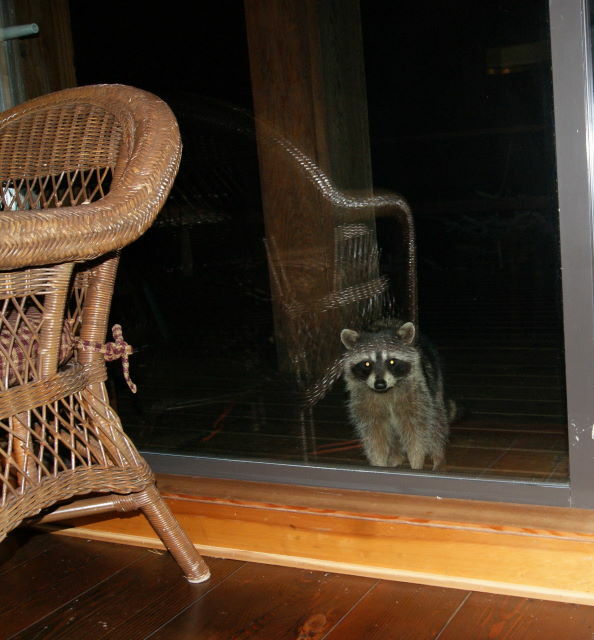 There had been plenty of raccoons around in the fall making a nuisance of themselves, getting into everything that wasn’t protected in a plastic tote and eating all the cat’s food but it has been months since we’d seen one. 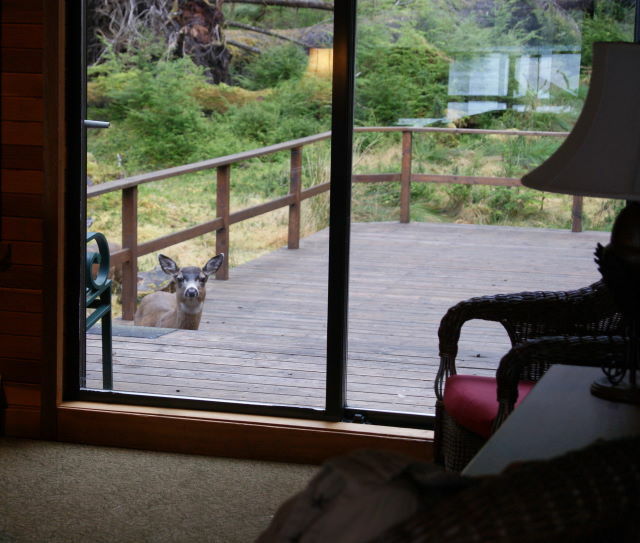 Our late night visitor was big and healthy looking, seeming to be right at home he moseyed around the front deck for about 5 minutes, even getting up on the bench outside to get a better view. Looks like we will have to get out the live trap once again and put this fellow into re-location program.